National Guard chopper near Arlington. Flooding on the Big Blue River in Nebraska. Highway 77 south of Fremont. A flooded field in Oakland, Neb. Verdigris Creek invades the town of Verdigre. A cattle death south of Columbus, Neb. Flooded fields in Burt County, Nebraska. Nebraska State Patrol provided this photo of cattle stranded on an island in the Platte River. Other cattle were huddled on other small pieces of land. Workers from Three Mile Creek Rodeo Co., in Kyle, S.D., hand-shovel cattle from 8-foot snow drifts after a blizzard March 14. Westbound Maple Street in Omaha. Highway 91 at the Dodge-Washington county line. The Elkhorn River meets Q Street in west Omaha. A Burt County road ends abruptly in floodwater. Flood waters are receding. Snow driven by hurricane-level winds will melt. And recovery has begun. The recovery cost will be extreme. One report said 200 miles of state highway will need to be rebuilt. “On the livestock sector, the death loss from flooding and the blizzard, and sick animals needing care, and rebuilding damage has reached $400 million of impact directly to the livestock sector; mostly to the beef sector,” said Nebraska Agriculture Department Director Steve Wellman. Regarding spring planting and field preparation, delays and impacts haven’t yet been calculated, said Wellman. “We have never had this impact,” Ricketts added. “We’re working as quickly as possible into the recovery process. As flood waters go down, be safe before you go in any homes,” Ricketts cautioned. No report had been made as of Wednesday morning on livestock death loss. There was a report of 800 hogs dying in a single incident near Fremont. No water got into the Lincoln Premium Poultry processing facility being built on the southeast corner of Fremont. She added that LPP has not heard of any of its growers who were impacted by the flood. Most of the growers, in eastern Nebraska stretching into western Iowa, are in the construction stage. The LPP plant and growers will supply rotisserie chickens to Costco stores. Fremont and Columbus were the largest communities in Nebraska that were surrounded by water, with no ground access in or out for several days. “I know that ADM Columbus had to shut down because half of it was under water,” said Megan Grimes of the Nebraska Ethanol Board. I haven’t heard from others, but potentially Louis Dreyfus in Norfolk and Valero in Albion could have been impacted. Green Plains location in Wood River might be another that shut down, but we haven’t heard that directly. “The main issue is railroad main lines are washed out, so they can’t ship ethanol out because the railroad is shut down. The railroad engineering team moves fast though, they’ve already staged ballast and are ready to fix the tracks once the water recedes. A staggering two-thirds of Nebraska counties have been declared disaster areas. Ricketts joined Vice President Mike Pence and Iowa Gov. Kim Reynolds on Tuesday to assess flood damage and emergency response efforts. The visit began with a survey of the flooding along the Missouri River followed by visits to hear from impacted families and thank first responders. During a meeting with the Federal Emergency Management Agency (FEMA) Regional Director Paul Taylor, Ricketts signed and submitted Nebraska’s expedited request to the federal government for disaster assistance. The request will be considered by FEMA’s regional office and headquarters. Ricketts was joined by Nebraska National Guard Adjutant General Daryl Bohac, Nebraska Emergency Management Agency Assistant Director Bryan Tuma, Nebraska Department of Transportation Director Kyle Schneweis, Nebraska State Patrol Col. John Bolduc and Nebraska Department of Agriculture Director Steve Wellman. With some floodwaters receding in the aftermath of historic flooding encompassing east-central, southeast, central and north-central parts of the state, a monstrous El Niño winter season and recent “bomb cyclone” storm dragging an intense low pressure system are blamed for three flood-related deaths, two missing persons, evacuation of homes, a devastating $400-million dollar toll on livestock, bridges pulled apart, roads washed out, a flooded church condemned and sewage back-ups. With snow and ice continuing to melt in warmer temperatures, more flooding is expected at least through Friday, March 22, and possibly beyond. Flooding along the Missouri River (east central Nebraska) is expected all week. 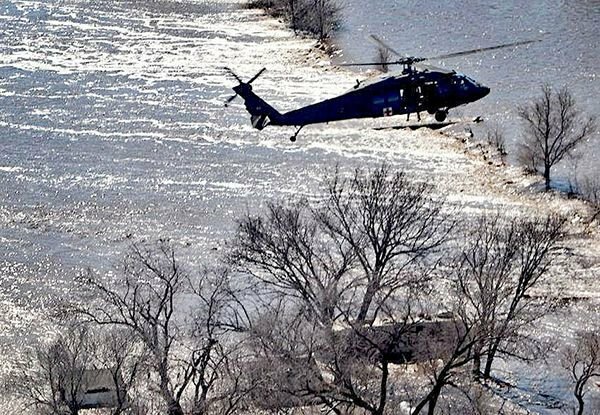 As of Monday, 163 people have been rescued by Nebraska State Patrol. Another 111 people were rescued by the National Guard, and 16 saved by Urban Search and Rescue. Then, there’s the significant impact on agriculture. Ricketts and other state officials advised Nebraskans against driving around barricades. “We’ve had people rescued who drove around barricades. We’ve had reports of fuel tanks and propane tanks in the flood waters that are showing up, so we’re arranging for collecting that type of debris,” said the governor. Also flood waters are very cold, and hypothermia is a real concern. “A number of sewer systems have been compromised into the floodwaters, and we’ve had instances of children playing in floodwaters, a formula for disaster,” said the State Patrol’s Bolduc. “Turn around, don’t drown” is the life-saving caution from the NWS when encountering flooded roads. Also “Stay away or be swept away.” Most flood deaths occur in vehicles. Officials are expediting the process for getting a federal major disaster declaration. Twenty-nine counties had mandatory evacuations, 18 counties let people return, six counties are not letting people back because of hazards, Tuma said. He’s also hoping to help replace tired local responders. After being isolated with raging floodwaters, Fremont got some relief Sunday night when a convoy of eight Hy-Vee trucks transported much needed food and fuel into Fremont. However, there’s considerable damage to infrastructure including roads and bridges. Downstream from Omaha is still in moderate flood stage, and then it’s in record flood territory. 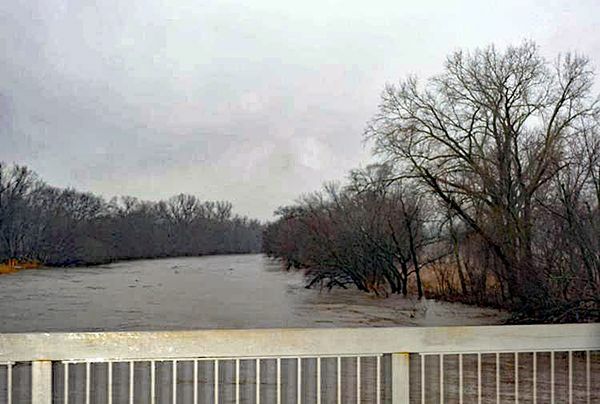 “The river is just now cresting and will probably be in record flood for the entire week (through March 23),” said Van DeWald, lead meteorologist with the NWS Omaha office, which also flooded when the dike failed Friday morning. Some of the forecasters are issuing alerts and forecasts from the Hastings NWS office. The National Weather Service has issued its 2019 Spring Flood Outlook for eastern Nebraska and western Iowa, and unfortunately, for much of that area, there is a much-above-normal risk for minor and moderate flooding this spring, largely the result of high soil moisture, elevated river levels and an increasing snowpack. With spring severe storm season arriving, the NWS has a full schedule of free storm spotter presentations offered across Nebraska and other states. The class provides a basic understanding of thunderstorm structure, spotting techniques, reporting criteria, safety information and procedures: https://www.weather.gov/oax/spotter. See more updates at www.midwestmessenger.com. Amy Hadachek can be reached at amy.hadachek@midwestmessenger.com. Terry Anderson can be reached at terry.anderson@lee.net.